Nomocharis aperta (Franchet) E. Wilson is a heterogeneous species including morphotypes with pink tepals bearing swellings on both sides of the inner tepal’s basal median channel and those with yellow tepals lacking swellings. 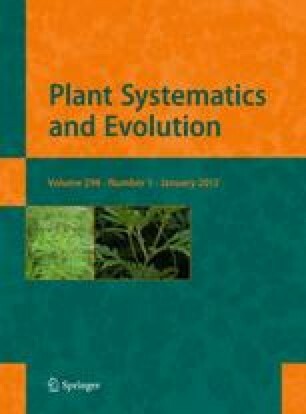 Molecular phylogenetic and pair-wise distance analyses of nrITS and chloroplast psbA-trnH support recognition of the yellow-flowered morphotype lacking nectary processes as a new, separate species of Nomocharis. Here, we present the new species, Nomocharis gongshanensis Y. D. Gao et X. J. He sp. nov., and resolve its systematic position in the Lilium–Nomocharis complex using the ITS and psbA-trnH markers. Seven variant copies of ITS were isolated from N. gongshanensis. Maximum parsimony and Bayesian analyses placed the clones in two different Nomocharis clades, N. aperta + N. saluenensis and sect. Eunomocharis, suggesting a putative hybrid origin of the new species. The psbA-trnH sequence of N. gongshanensis is identical to that of N. saluenensis, indicating that the latter may be the maternal ancestor. Our analyses support the monophyly of Lilium–Nomocharis and mutual paraphyly of the two genera. Nomocharis was resolved within Lilium as sister to the European lilies of sect. Liriotypus (sensu İkinci). The 12 Lilium–Nomocharis clades recovered in this study are consistent with previous molecular studies but are incongruent with traditional circumscription of and subgeneric divisions within Lilium. These results highlight the need for taxonomic revision of Lilium to accommodate Nomocharis and reconsideration of the origin and evolution of Nomocharis. The online version of this article (doi: 10.1007/s00606-011-0524-1) contains supplementary material, which is available to authorized users. The authors thank anonymous reviewers and Professor Jie-mei Xu for valuable suggestions on improvement of the manuscript as well as Hai-feng Wang at the Graduate University of the Chinese Academy of Sciences for assistance with obtaining primary literature sources. This work was supported by the National Natural Science Foundation of China (31100161), the Doctoral Fund of the Ministry of Education of China (20090181110064), the Basic Research Program from the Ministry of Science and Technology of China (grant no. 2007FY110100), and the Research Fund for the Large-scale Scientific Facilities of the Chinese Academy of Sciences (2009-LSF-GBOWS-01).